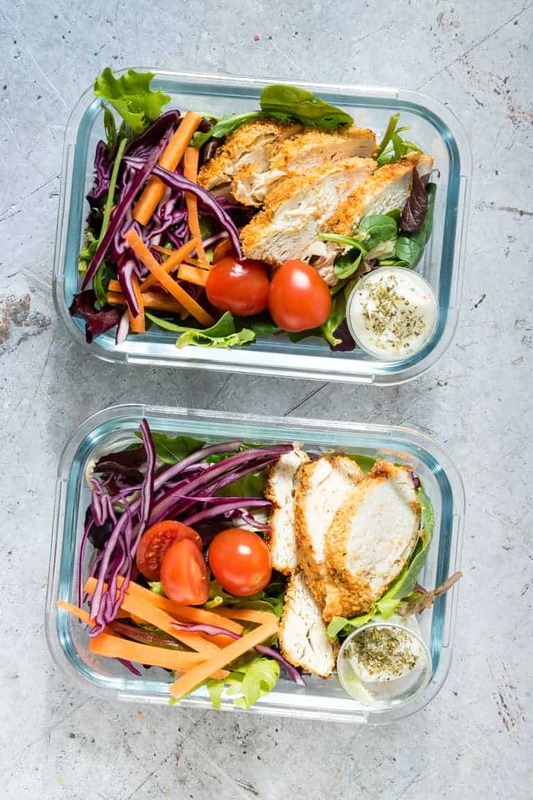 This Air Fryer Chicken Breast Recipe is super healthy, full of flavour and very versatile. I looooove that I can indulge in the deep-fried classic taste without the guilt since the air fryer only needs a fraction of the oil. Modification available to make the recipe suitable for Gluten-Free, Low Carb and Keto dieters. Post includes Weight Watchers points. Folks, the air fryer is a must-have item in everyone’s kitchen. 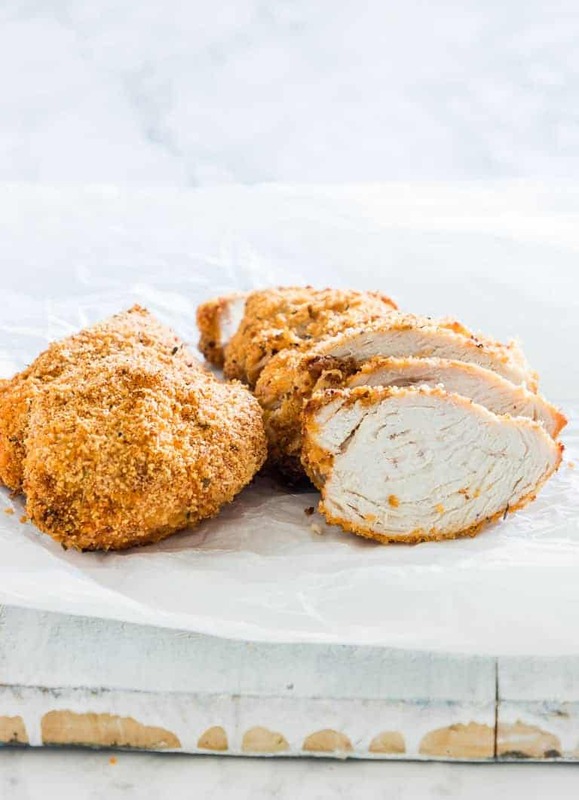 Because you get things like perfectly cooked succulent Air Fryer Chicken Breasts complete with crispy breading and absolutely no pan frying involved. Yeap, no-guilt eating is how I like it. 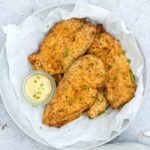 And I show you how to make these awesome Air Fryer Fried Chicken Breasts step-by-step so you can like it too. The mini chefs have been begging me for more air fried chicken ever since they devoured Air Fryer Chicken Thighs recently. It is their new favourite and soooooooo easy for us all to make together. 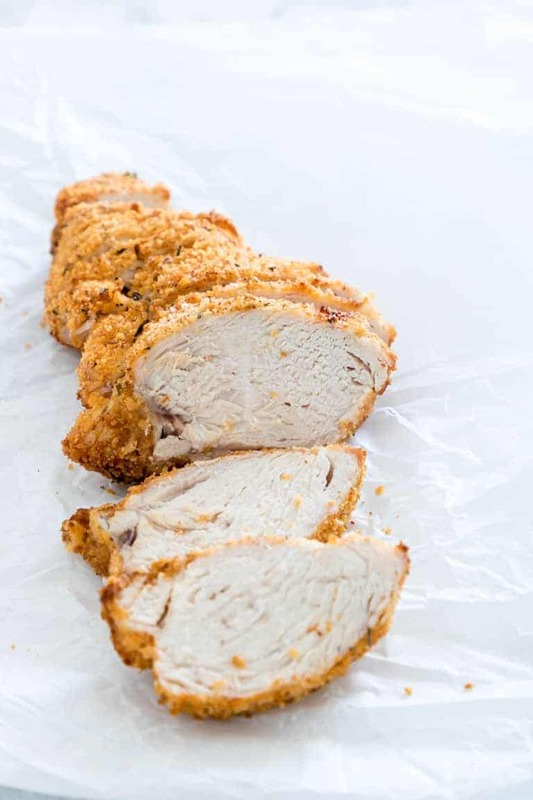 And this Air Fryer Boneless Chicken Breast recipe is crispy. Not “maybe it’ll crisp up in the oven” crispy. It is real deal “how did they get this so crispy but moist and juicy on the inside” crispy. #result. Cooking with the air fryer is so amaaaaaaaazing. First of all, your food isn’t cooking in a big pot of hot oil. The air fryer will ‘fry’ your food with a small amount of oil. For this recipe, I used a light low-calorie cooking spray but you can also use a small amount of olive oil. Much less olive oil gets absorbed into your food which means less fat and calories for you. Winner winner air fried chicken dinner. We are all eating healthy crispy chicken from now on and no one will ever know the difference. Use please this to check the internal temperature of the chicken. Try this spice kit for different flavours on your chicken. 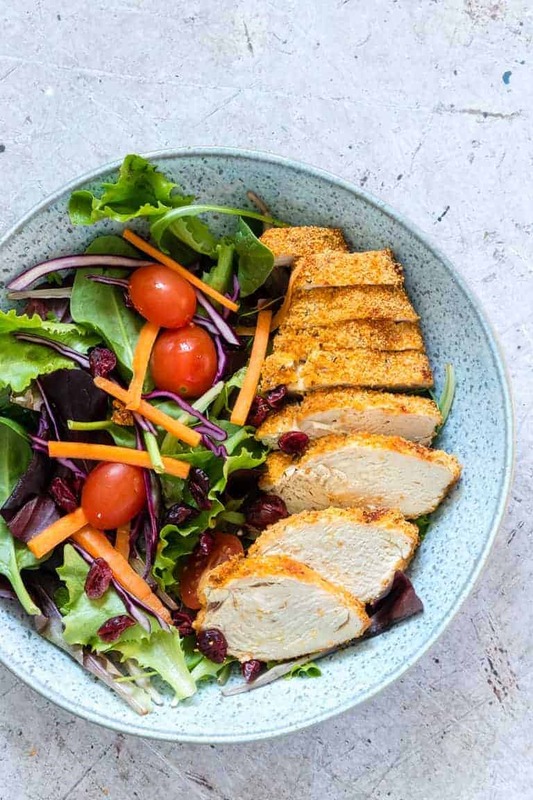 So, are you ready to make this healthy and flavourful Air Fryer Chicken Breast? Grab your ingredients and let me show you how……. Mix together breadcrumbs, Parmesan cheese, paprika, Herbes de Provence, ground coriander and the best sea salt. Lightly spray both sides of the halved chicken breasts with a calorie-controlled cooking spray. Then cover both sides of the chicken breast halves with the coating mixture and place them in the air fryer basket. It is important to make sure the two halves of chicken breast are not touching. Cook time for the first side will be between 4-5 mins. Check the meat for doneness, then flip over and cook for an additional 4-5 mins. The process for cooking whole chicken breasts in the air fryer is the same as cooking the halves. You’ll just need to allow for more cook time. First, preheat air fryer to 350F / 180C. Then combine breadcrumbs, Parmesan cheese, paprika, Herbes de Provence, ground coriander and the best sea salt. Lightly spray both sides of the whole chicken breasts with a calorie-controlled cooking spray. 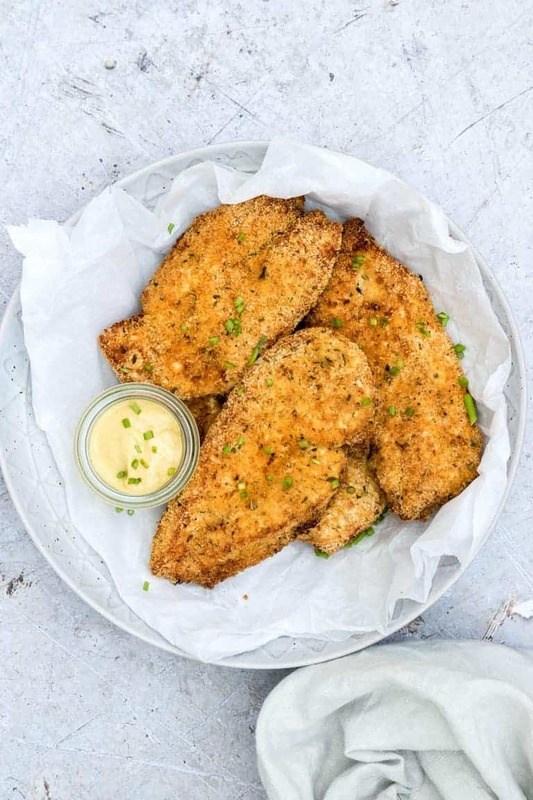 Coat both sides of the chicken breasts with the breading mixture and place in the air fryer basket, making sure they do not overlap. Cook the first side for 15-18 mins, then check the meat for doneness. Turn over and cook for an additional 8-10 mins, depending on the size of chicken breasts. I love cooking chicken in air fryer. Here are a few tips to help you make the best air fryer fried chicken recipe. Don’t overcrowd the fryer. Make sure the chicken breasts are not touching each other to allow for maximum air circulation so that they cook nice and evenly. I got between 2 and 3 breasts into my air fryer without touching. Always check the internal temperature of your chicken breast. The meat is done and safe to eat when the internal temperature reaches at least 74C (165 F). Chef’s Tip: Make sure to press the crumbs down firmly on the chicken breast before placing in your air fryer. The fan is powerful, and if the coating is too loose and not adhered properly it will blow all that deliciousness right off. 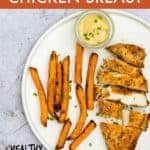 This Air Fryer Boneless Chicken Breast Recipe is sooooooo versatile. You can swap out the coriander for Cajun spices or Creole seasoning. I love to create a little heat by adding a pinch or cayenne or some red chilli flakes. If you’re not on a calorie-controlled diet you can use olive oil instead of a no-calorie cooking spray. The whole family will love it. I get my mini chefs to devour every last bite of the Air Fryer Boneless Chicken Breast without any guilt over them eating a plate full of fried food. Use up those pantry items. This is why I loooooooove recipes like Air Fryer Chicken. I can customise based on what is already in my pantry and still end up with perfectly cooked flavourful chicken breast every time. Getting the breading right can be the difference between crispy and soggy chicken breast. Breadcrumbs or panko breadcrumbs give really good results, aka crispy chicken breast. Almond flour works well too. 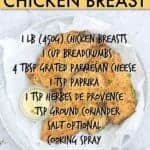 One way to bread the chicken is to lightly coat it with low calories cooking spray or olive oil before coating it in your bread crumbs. This is the way I prefer. Alternatively, you can dip it in egg before coating it with the breadcrumbs. This changes the flavour very slightly, but not enough to make a big deal out of it. Try both ways and see which you prefer. Also, make sure you let the excess egg drop of the chicken breast and it is as dry as possible before coating in the breadcrumb. 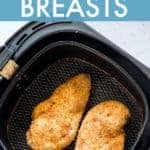 How To Make Sure Your Air Fryer Chicken Breast Crispy? Don’t let the chicken breasts sit in the coating mix or it will get soggy. Coat the fillets and then immediately place in the air fryer to cook. Coat both sides and then get it in the fryer ASAP. Also, you want to use a very small amount of olive oil spray or a brush a small amount of olive oil on the breasts before dipping. I really do mean light as if it is swimming in oil you will end up with a soggy coating (and loose the benefit of the air fryer aka cooking with minimal oil). 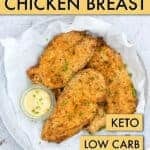 If you prefer to make air fryer chicken breast with no breading then you can do that too. Simply spray the chicken breasts lightly with some oil, season to your taste and cook as normal. 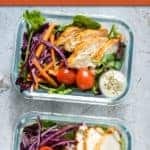 How Long to Cook Chicken Breast in Air Fryer? Wondering how long to air fryer boneless chicken breast? Cooking times depending on the thickness of the breast. Mine took 4 mins per side. When cooking Air Fryer Chicken Breasts the first time, I recommend aiming for 4 mins per side and then checking for doneness. If you’re cooking whole chicken breasts without cutting it down, then cook for 5-8 mins per side. Please use a meat thermometer to check the internal temperature. The meat is done and safe to eat when the internal temperature reaches at least 74C (165 F). Continue cooking for a few minutes more if needed. If you dont have a meat thermometer then simply, remove the chicken breast from the air fryer and slice into the middle section. If the breast are white all the way through with no pinkness at all, then they are done. 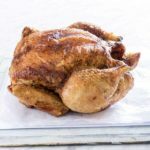 It is easy to make this Air Fryer Chicken Recipe keto friendly and gluten-free. Simply replace the breadcrumbs with almond flour. It adds a great depth of flavour and provides a wonderful crunchy texture. Which is the perfect contrast to the tender and juicy meat. 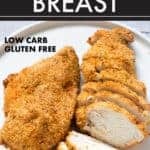 Even if you are not following a keto, gluten-free or low-carb diet, this combination of almond flour and parmesan cheese is a wonderfully delicious coating mixture that you will want to make again and again. Starting with Air Fryer Frozen Chicken Breast instead? Yeap, you can cook frozen chicken breast in the air fryer too. If you are cooking whole frozen chicken breasts (ie not halved which is more likely) you will cook them for about 20-25 mins depending on the thickness of the chicken breasts. Always check the temperature of the cooked chicken before eating it. Is the Air Fryer Healthy? Yeap! The air fryer is healthy and a great way to control your calories. As I mentioned before, since you’re not using a ton of oil it won’t be absorbed into your food which means your food will contain less fat and be lower in calories. It is definitely a learning curve to work through, but the air fryer produces crispier chicken with much less oil. Some foods that are fattier or come straight from the freezer like French fries won’t require any added oil at all. 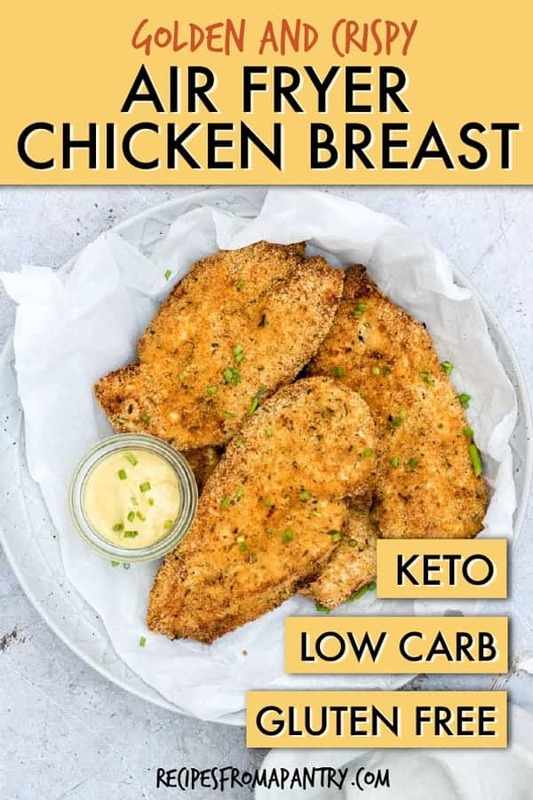 For foods like this Air Fried Chicken Breast that have been coated with breadcrumbs or flour, I recommend you spray the basket or rack with light cooking spray and then lay in your chicken breasts, making sure they are not touching. Once they are in, give another light spray just to coat the tops. The tiny bit of oil is essential to get your chicken crispy brown. Don’t overdo it though. You can end up with food that is too soggy to serve. There is just 2 Freestyle Point in a serving of Air Fryer Chicken Breast. There are 206 calories in each portion of air fried chicken breast. How many times have you found yourself asking: How long should I cook this? And at what temperature? Well folks, my handy Air Fryer Cooking Times Cheat Sheet takes the guesswork out of air fryer cooking and gives you all the important information you need in one easy-to-reference page. Thank you for reading my Air Fryer Crispy Chicken Breast Recipe post. And please come visit again as I continue dreaming up recipes, traditional African recipes, African fusion recipes, Sierra Leone recipes, travel plans and much more for you. Thanks for supporting Recipes from a Pantry, UK food blog. Don't forget to tag #recipesfromapantry on Instagram or Twitter if you try Air Fryer Chicken Breast! It is really, really awesome for me when you make one of my recipes and I'd love to see it. You can also share it on my Facebook page. Please pin this recipe to Pinterest too! Thank you for reading Recipes from a Pantry. 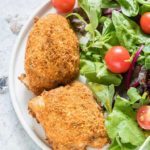 Air Fryer Chicken Breast is crispy on the outside and juicy on the inside! Preheat the air fryer to 180C / 350F. Mix together breadcrumbs, parmesan cheese, paprika, Herbes de Provence, ground coriander and salt in a bowl. Lightly spray both sides of the halved chicken breast with a calorie-controlled cooking spray. Cover both sides of the chicken breasts with the coating mix and place chicken breast in the air fryer basket. Make sure the chicken breasts are not touching. Cook between 4-5 mins then flip over and cook for 4-5 mins on the next side. " Cooking times depending on the thickness of the breast so maybe a little more or a little less. Chicken is done when it reaches an internal temperature of 75 C (165 F). Don’t leave your chicken sitting in the coating for too long as it can go soggy. Coat both sides and then get it in the fryer ASAP. 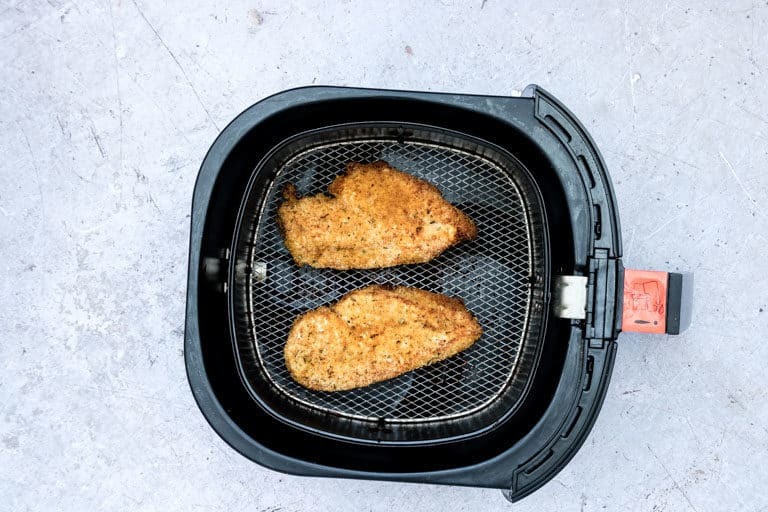 There are just 2 Freestyle points in one serving of Air Fryer Chicken Breast. Love that you can achieve crispy chicken breasts without using a ton of oil! I’ve been considering getting an air fryer and this recipe might just be the first I try in it. These look perfectly crunchy and easy to make. Great recipe! Great minds think alike! 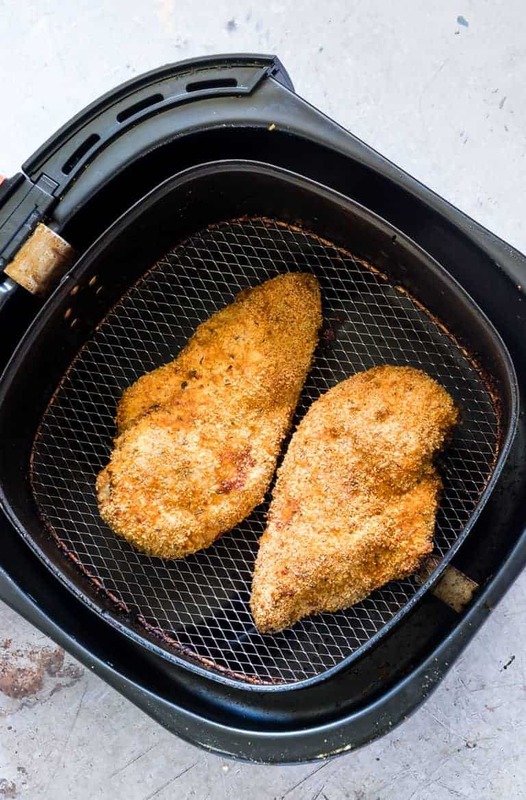 We are obsessed with our air fryer at the moment and love making crispy chicken breast in it. We have a recipe coming up soon too! 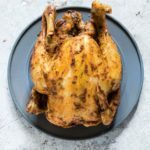 I don’t have an air fryer, but recipes like this make me consider buying one! Now I am considering buying an air fryer during this holiday season. The chicken looks so delicious. Love the recipe. Your recipes look delicious. Trying the fried chicken breasts tonight. I think I’m going to be a big fan of your recipes. Thanks for all you do to put this together. I keep hearing such great things about the air fryers! That crisp is perfect! So great that it’s a healthier option. Wow that looks so delicious!. 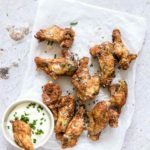 I have often wondered what to make in the air fryer other than fries and this looks so tasty and doable. I think I can give this a try. I’m living for all these air fryer recipes! Love the parmesan added to the breading, great flavor and texture!